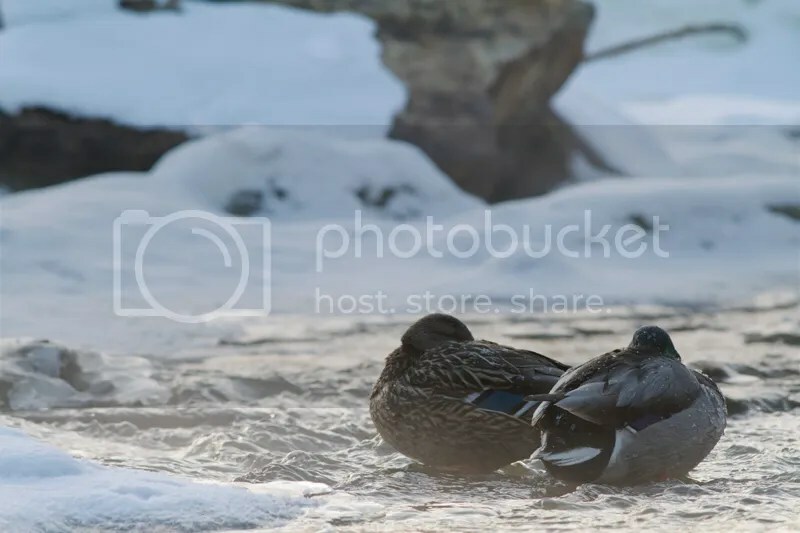 This time it’s a photo of a Black Duck that i took last week-end on a cold morning (-22C) around sunrise. The fog add to the atmosphere of the silouhetted Duck. Canon 7D with 400mm/5.6L, tripod. Second outing for photographing Ducks in winter. This time it was around -22C with winds from 40 to 60 Km/h, so the temperature with the windchill factor was around -32C. First thing, if you want to keep shooting and be comfortable enough to concentrate on your photography and not on your cold feet and fingers you need to dress for the conditions. So i was well dressed so i was able to stay out and shooting without any problems. 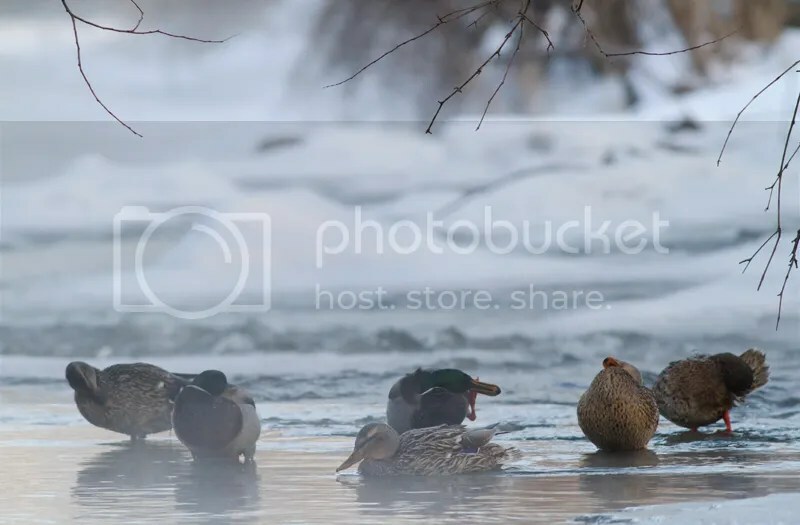 My goal was to show how hard it is for the Ducks to survive during winter, most of the Ducks were trying to keep their body heat by sleeping on the ice on the shore of the river. I’m always impressed that those Ducks stay here all winter in those conditions when they can flew south, peoples giving them food probably persuaded them to brave the long Canadian winter. So, this time i finally concentrated my efforts on capturing the cold and foggy mood of that morning. 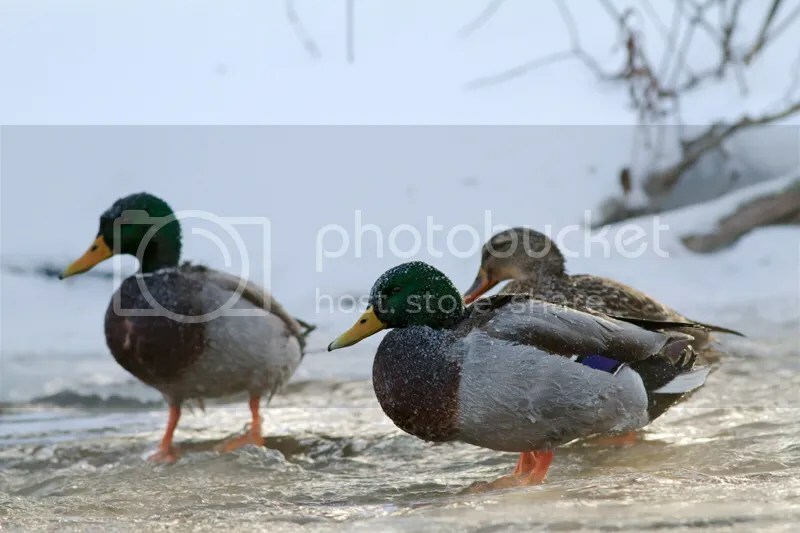 The Ducks were covered with a thin layer of frost and some even had ice on their back. A Male Mallard Duck on the ice, i wanted to show him in it’s habitat and included the frozen waterfall in the background. Canon T3i with 70-200mm/4 L, tripod. 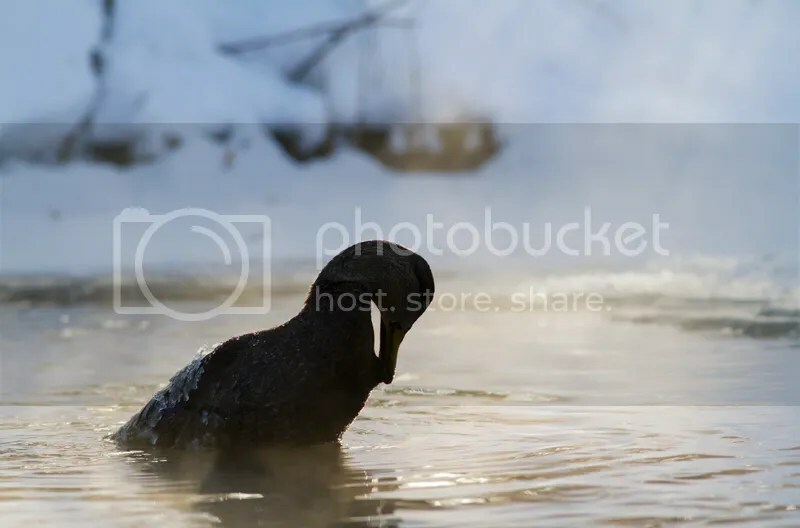 Bath time, a Black Duck covered with ice on it’s back, the sun hitting the fog added to the atmosphere. I let the Duck go darker in PP to keep the silouhette effect. Male and Female Mallard Duck in the river, in PP i kept some of the blue cast in the snow to convey the coldness of the morning. Stop it, your feathers are beautiful now ! When i was walking down the trail to the river in the morning i found feathers on the ground and the remaining of 2 wings, i decided to wait and go for the Ducks first and get back to photograph the feathers later. So when i finished photographing the Ducks i walked back to my truck and was looking for interesting feathers to photograph when i felt that something was looking at me. 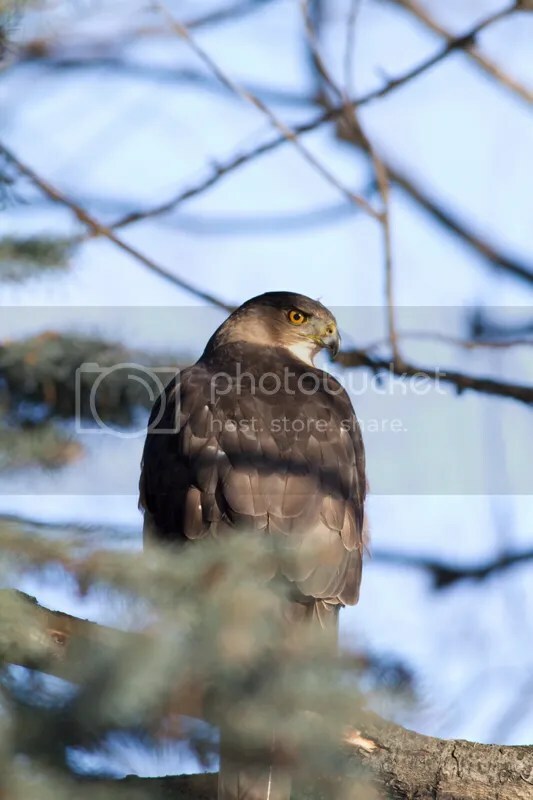 Looked up and saw a Hawk on a branch, pretty sure that it was a Cooper’s Hawk, he found a very reliable source of food for the winter ! I probably interrupted it’s hunting session. I have to admit that it’s not a very good shot but i managed to grab some quick photos between the branches before he flew away, missed the focus on the eye and cut the tip of it’s tail. After 2 hours the sun was too high in the sky and the contrast was too much to make interesting photos, so i decided to end my photo session there. I wanted to take photos with my WA lens but it didn’t happened that time, maybe next week-end. I didn’t got “The Photo” of a frosted Duck i was looking for but i got some usable shots anyway and you always learn something about your craft and especially about the birds. By going often i will learn the habit of those Ducks and will eventually get better photos from that place.